In my house, at the foot of the stairs, is a picture that I bought some 16 years ago. The buying of the painting was quite an important personal moment in my life (I won’t bore you with it now, but I can remember the exact details of how, where and why I bought it) and I must have looked at it every day I’ve been in the house ever since. It’s a picture of images – doors, walls, columns, squares… it looks like it could be a real place… but it isn’t. Its an impression of a reality, rather than reality itself. I mention this because it has often occurred to me that some Dylan songs are like that picture – they are made up of realistic elements, but they don’t coalesce into a clear finite image of the real world. They are, like my favourite picture, reflections of overlapping elements taken from reality – not photographs of reality. As I went out one morning is like this. That title itself is like the representation of a standard door. The folk version of “I woke up this morning” in the blues, as Heylin has pointed out. But although this is a commonplace, what happens next is anything but commonplace for suddenly we are into the world of Tom Paine. I’ve pondered long and hard about Tom Paine in this song, and have come up with all sorts of explanations as to what Dylan was referring to. I am not sure which, if any, are true. Tom Paine the French revolutionary, Marianne (the girl) was and is the symbol of the French Revolution, Tom Paine was one of the cornerstones of the American revolution, Tom Paine was also a famous British engineer, there’s an apparent link I’ve found with WH Auden, the English American poet of great renown, and we have the National Emergency Civil Liberties Committee… it goes on and on. Quite possibly many of these people and concepts were all lurking about in Dylan’s mind as he wrote – and it is indeed interesting that he wrote the music not in a normal major or minor key of the type that we hear in 99.99% of our music today, but in a mediaeval mode. I think it is the phrigian mode – if you want to experiment sit at the piano and play the white notes only from E up to the next E. That scale of eight notes doesn’t sound major or minor, but actually sounds rather old and mediaeval. That is the phrigian mode – it was quite a thing in the 15th and 16th centuries – but of course not much used now. At once it sounds, well, mediaeval. Tom Paine (9 February 9 1737 to 8 June 1809) was an English political activist whose life I first came across when studying the French Revolution of 1789, is indeed still a most famous man not least because he is considered one of the cornerstones of the American revolution and the inspiration of the revolt of 1776. I know of him not just because I studied the French Revolution because two of the towns he lived in – Thetford in Norfolk and Lewes in Sussex – are towns I know. The former because it is not too far from where I now live and indeed I was there just a few weeks ago, and the latter because it was close to where I studied in my teens and early 20s. More well remembered in the UK and indeed in France is The Rights of Man which defended the French Revolution even as it was turning into the Terror. Paine was tried for sedition in England, and elected to the National Assembly in Paris only for Robespierre to have him subsequently arrested. He escaped the guillotine however and eventually it was Robespierre himself who was executed and Paine who was released. In 1802, he returned to America for the last time but when he died only six people attended his funeral – due to his rejection of Christianity which the citizenary of the new world hated – although it was much in favour in revolutionary France. Here’s the Thetford plaque (there is also a statue to him in the town, but I don’t have a picture of that). Paine was also an engineer and in 1796 designed the Sunderland Bridge. (There is still a bridge at this point, but it has twice been rebuilt). It became the prototype of iron and steel bridges. And so having discussed Tom Paine what on earth do we make of this? Are we to take it that the damsel is the Revolution? The French symbol of the 1789 revolution (the great revolution in France, which led to the break with the rest of Europe as it established government without monarchs, although ultimately led to the rise of Napoleon), and indeed the French symbol of Liberty to this day, is the woman Marianne whose image is still displayed in the law courts, and indeed on euro coins in France and its postage stamps. She is the symbol of the republic, democracy, freedom and ultimately Liberté, Égalité, Fraternité. But enough of France. What about the National Emergency Civil Liberties Committee? Dylan received the Tom Paine Award in 1963 from the National Emergency Civil Liberties Committee. His subsequent off-the-cuff speech contained a series of references to the world being confused and old timers being out of date was met with at first laughter and then disdain from some of the audience. Having just listened to it again I am not sure it is one of Bob’s more impressive monologues. Moving on, let’s try another link: “As I walked out one evening” by WH Auden. A different time of day but a similar meter, and surely a man of Dylan’s reading will know Auden as much as he knows the oft-quoted TS Eliot and Ezra Pound. The poem continues and if you don’t know it I recommend it – but then I recommend all Auden so maybe that doesn’t mean too much. Which leads me to think, maybe Dylan also must have known not just that song but also Funeral Blues from 1938. If it is new to you try this version read by four different actors. I think of this not just because it is a famous Auden poem (famous in England at least) but because here there is a feeling of separation and uncertainty that Dylan achieves – although seemingly travelling in a different direction. So what I am saying is that this song is not, as one commentator put it, “dripping with meaning” but is instead “dripping with unresolved images,” allowing us to make a million meanings out of it, just as I do with my picture of the door, the wall, the columns etc that I consider each morning as I come down from another night’s sleep. Yes some of those images might be metaphors, and so might some of Dylan’s words, but mostly they are, to my mind, suggestions of images you can build yourself. 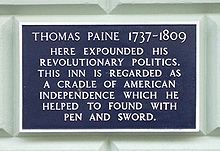 If you want to go further the clue is surely that the signer went to breathe the air around Tom Paine’s, meaning to grasp the meaning of Tom Paine’s incredibly important and decisive writing, the writing that influenced perhaps the two biggest revolutions in the history of the formation of the West. But despite Tom Paine’s offer of liberation we (the girl) are still enchained, because our governments have sought eternally to remove the freedoms that Tom Paine contemplated. The Marianne effect – and Marianne is now in chains. In one sense we could be seeing that the relations of two people at the individual level are as complex as the problems of building a complete society. And personally I love the notion that by offering Marianne as a symbol of the Republic, I will be harmed. For every supporter of the Revolution it was ever thus. The revolution is our greatest chance and turns into our greatest defeat. So the revolution, at least in France, failed to live up to its original ideals. As I am far less a student of the liberation of America from British rule than I am a student of the French Revolution of 1789 and the aftermath, I can’t say if the same is true of America, but to me, as an outsider, an occasional visitor, I find the USA in its current form far from the land Paine wanted it to be and the land he proposed in his writings. So there we are. Either a painting of ideas in the form of real people, just like the work that hangs at the bottom of the stairs in my house in Northamptonshire, or an allegorical poem about the outcome of Paine’s writing, and the corruption of the revolution. Details of all the songs reviewed on this site. The songs of Dylan in chronological order. This song is a simple allegory about personal freedoms – An ideal, yet unattainable goal as ranting total freedom for anyone can only be done at the expense of others / denying freedom for others. She is “Freedom” or “Liberty” as you wish to call her, and she takes his hand. She is a “femme fatale”, when you have known her you can never forget her, hence the singer is now forever wounded and Tom Payne (A champion of personal liberties) is apologizing. But, such freedoms, even in the south (we’ll fly south) are only a dream. We are born free, but everywhere we are in chains: Rousseau. The chained damsel has internalized social demands.. Dylan offers support, his hand, but society wants conformity and control over individual freedom and independence. She takes his arm; she will do him harm, take away his artistic creativity. I think it starts and ends with getting bitten by a white dog on a leash that got away from its owner named Tom Paine, or perhaps a flightless goose in a pond up inNew Rochelle next to Tom Paine National Society headquarters. Nobody can be profound all the time, and certainly Dylan has shown by that time he liked to poke fun at people taking him too seriously, understandably. Tom Paine, as a Deist, places God outside of the Universe, leaving it up to the rational side of man’s mind to search out justice in the face of overbearing social authority. Examined from the perspective of religious theological history, the John Wesley Harding album is a fragmented surrealistic dream involving the thoughts of the Jewish Moses, Catholic Saint Augustine, and Methodist John Wesley concerning established law, good works, and devout faith in relation to God’s will. This song has always felt like a medieval tale to me, almost in the same way that John Barleycorn by Traffic does (but better crafted and in it’s brevity, less literal and more romantic). For a long time, being unaware of the musical mode it’s written in or that it was in fact penned by Dylan, I thought it was a traditional song he covered. To me the story is about a warning that can’t be heeded, a line forever crossed. What ever has befallen the hero of this story is a fate that can’t be undone, we can only bare witness to this. It’s his fate (and ours) and he’s doomed to it even though it comes in a beautiful siren form. We’re left to realize what we know but can’t often bring ourselves to believe, that illusion is not to be trusted or touched without somehow being altered by it. George Harrison wrote of this too, Beware of Darkness (Beware of Maya). Maya = Illusion. Ultimately in this story the very ground our hero thought to be a familiar safe reality (Tom Payne’s) becomes his prison, possibly his hell. The fairest damsel is in chains… a spirit form, in essence she is death (of self). Falling for her beauty the hero gives his hand to her and his ground begins to shift, he starts to plead with this angel who will take his reality not to realizing yet she isn’t bound to any free will of her own, she simply… is. “Said I, but you have no choice.” That isn’t a demand, it’s a statement of concession. Tom Payne himself, the damsel’s father (creator) appears as if having been searching for her franticly knowing she’s capable of both beauty and destruction, but by then the die is cast and only apologies can be offered on her behalf. Tom Payne isn’t taking the responsibility here, but he feels deeply troubled by it. The horse is out of the barn. So what is the meaning? I am not up on the many historical figures and references we might draw from regarding Tom Payne’s role in this song but I think the medieval scale suggests an almost black art is at play and I doubt Dylan is writing about the distant past as much as he’s talking about something that holds some parallel in his own time. This could be a tale about illusionary practices in Dylan’s time period of this album and his experiences with LSD comes to mind as a possible parable here but also many of the things he may have encountered in himself he may have mistaken for one thing only to find they were another. I hate to malign such a beautiful and romantic (not in the love sense) song as simply a drug song… it seems to offer quite a lot of avenues to apply ideas to, but it does sound like it’s from another time and place and it’s trying to say something just as it’s losing it’s ability to speak. I think it’s a highly personal song about Dylan’s biggest boogeyman, being pigeon-holed as the “Voice of His Generation.” He was lionized/idolized even as early as 1963 when he got the Tom Paine Award. The “fairest damsel” who took him by the hand and meant to do him harm was the immensely seductive temptation to accept the fawning worship that comes with being the messiah and voice of his generation. “No thanks” says Dylan, “I will not walk in chains with you, no matter how enticing you are – – you scare the hell out of me!” and to his fans he says “I am an artist and the box you are trying to stick me into is anathema to my freedom. I decline any expectations you may have of me.” Tom Paine, perhaps the most radical advocate of personal freedom in history, is very sympathetic to Dylan and runs to his aid at the end of the song. In part, Dylan may be using the song to explain why he had been so ungracious and truculent at an award ceremony celebrating (enslaving) him. As a side note, after reading this review I googled Tom Paine to learn more. Apparently he was living in Greenwich village when he died. Makes a nice full circle to Dylan I think. Thanks for everyone’s imput on this song. John Wesley Harding is one of Dylan’s best and most enigmatic works. I’m 72 and have been listening to Bob Dylan since I was about 14. Early on I think I grasped that to truly listen to a Dylan song you have to listen in layers and not demand to make a certain sense out of it. I am a beginning abstract painter and listening to Dylan leads me into my paintings/collages.